JR Norris came into Nashville the favorite to possible walk out of the historic track with the NASCAR Southeast Series point lead. 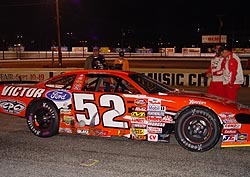 He was only a few points behind leader Jeff Fultz and, in the past, there has been only a couple of drivers that could even come close to running with Norris’ #5 at the old Fairgrounds track. Things looked to be plying out as normal on Sunday night. Norris had moved up to third from his fifth-place starting spot with relative ease, getting around Fultz in the process. However, just a couple of laps later, Norris spun around in turn one and slammed into the turn two wall, all by himself. The resulting accident knocked JR out of the race. He finished 21st in the 22-car starting field. It dropped Norris back from a legitimate shot at the title to a long shot, now fourth in the standings, 87 points out of the top spot. It was also a kick in the pants, since it happened at Nashville. It is a track that Norris has yet to win at, despite being fast every single time he’s raced at the track, be it in a Southeast Series car or a straight-rail Super Late Model. Jason Hogan had moved up to third late in the race and found himself behind the #52 of Tim Sauter on the green-white-checkered finish. After the race, Sauter’s car owner Richie Wauters wasn’t overly happy with Hogan’s aggressive driving style and had some words for the new second-place points man. Nothing more than words were traded and everyone went their separate ways. “I wasn’t happy with the finish,” said Sauter. “I’m mad because we got third. I should have took care of those behind me before I worried about what was in front of me. Oh well. Hogan had fun racing at the end of the night, and knew that the heated tempers was just a result of frustrations from the race, especially with Wauters’ other car (JR Norris) falling out early. “We had that last restart,” said Hogan. “The 86 (Gary Helton) didn’t go right away and I just got a good run on Tim (Sauter). 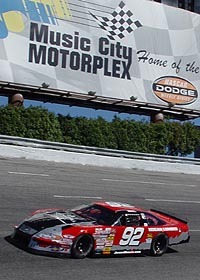 That was Jeff Fultz’s thoughts on coming into Nashville on Sunday, a track that the two-time Southeast Series champion has struggled at the last couple of years. 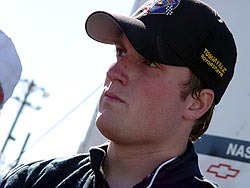 In fact, it was in the final race of the year last season at the same track that Fultz struggled home with a 13th-palce finish that earned him the title by just 19 points over JR Norris. Sauter's #52 had a couple of donut marks after the late race battle with Hogan. To say it nicely, the two drivers raced extremely hard over the final couple of laps, looking for that second position. Some beating and banging ensued, and Hogan grabbed second, with Sauter holding onto third. This time though, it was a different story for Fultz. His #54 ran better than it has in the several past trips to the track, earning him a fifth-place finish and a healthy points lead heading into the final race of the year in Montgomery (AL). Fultz leads Jason Hogan in the standings by 64 points. “We had a good car in qualifying,” said Fultz. “We unloaded here and weren’t very good. We tested here and weren’t very good. We just can’t get the grip on this place we need to get. We qualified good and got a good draw. The car got loose, so I had to start taking it easy. I just started riding and letting people go and point-raced the rest of the night. It isn’t a fun thing to do, but we’ve been in this predicament before. We just wanted to get out of here with a top-five. That is what we were able to do too. Fultz’s night changed on lap 10 though, when his closest points rival JR Norris slammed into the wall and knocked himself out of the race. After a mid-season slump that actually saw a couple of races with fields of no more than 15 cars, the car counts have started to rise again in the Southeast Series as the year comes to a close. A total of 23 cars were in Nashville for Sunday’s event, the highest total in several races. Tim Sauter returned to the series for the first time since 2003. In five previous starts in the Southeast Series, Tim’s track record was pretty good, with two wins, a second-place run and two DNFs. Jeff Fultz was in a good mood and had a little fun with the 51 photographer before the race. He was in a better mood after the event. However, only 21 cars actually started the event. 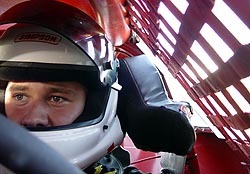 Ricky Turner was in Nashville behind the wheel of the #41 normally piloted by Chris Davidson. However, Turner’s engine blew in practice and the team didn’t replace it, sending him home early. but crashed in qualifying and wasn’t able to make repairs. 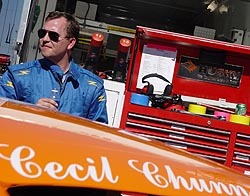 He, however, was credited with a 22nd-place finish in the final rundown after at least making a qualifying attempt. Sunday wasn’t 18-year-old Josh Hamner’s Southeast Sereis debut. That actually came a couple of weeks ago when he piloted the #33 Richardson Racing Chevrolet at South Georgia Motorsports Park while subbing for regular driver Robert Richardson. In Hamner’s first SES start, he finished an impressive fifth. 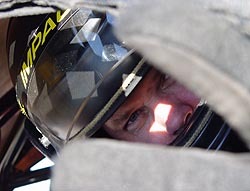 However, Hamner kind of felt like he was making his Southeast Series debut all over again on Sunday when the series visited the Music City Motorplex. This time around, Hamner was debuting his family-owned #38 Chevrolet. And just like at South Georgia, Hamner turned some heads, despite having the big yellow “rookie stripe” on his rear bumper, when he captured the Bud Pole on Sunday afternoon, leading up to the 150-lap event. Hamner’s pole run on Sunday actually broke a streak by Norris of three-straight poles at the Fairgrounds track, dating back to last season. After winning the pole, Hamner then pulled a 10-pill, forcing the top 10 cars to be inverted, and putting him near mid-pack to start the event. “I was a little disappointed with where we had to start, but that is just part of the game,” said Hamner. “We knew we’d have to come up through the field and that we’d have a long way to go. Unfortunately, when the green flag dropped, the car just wasn’t handling right. It was really loose and I was having to chase it up the track in the corners just to find some good grip. Hamner finished the event in ninth. It was an accomplishment just to finish, let alone to partake in the adventurous racing weekend Charlie Bradberry had set forth for himself. And no one will blame him if he slept in just a little bit late on Monday morning. That is because Bradberry completed his “triple duty” weekend on Sunday by competing in the Southeast Series in Nashville. That race was Bradberry’s third in three consecutive days, at three different tracks, in three different states. And with one win, a pole and another top-five run coming into the final race of the three-day stretch, Sunday’s 16th-place finish wasn’t how he wanted to end it. Bradberry qualified third and started eighth after the invert. After falling back early, Bradberry was working his way back through the field and was running eighth, battling for sixth and seventh when he was spun by a lapped car and crashed against the inside wall. After assessing the damage, Charlie called it quits just a few laps from the end. Southeast Series races earlier this year. “We’ve been struggling with this car the last few times we’ve raced. I don’t know why. The car was tight, tight, tight. We came in and nothing seemed to get it right. If Sunday evening’s Southeast Series race at Music City Motorplex is any indication, Jason Hogan might have another career waiting in the wings if his racing doesn’t work out. Hogan could pack up and head out to Hollywood to be a script writer. Why? Because the story of his runner-up finish went exactly the way that he plotted it out before the race weekend. With the exception of one position in the finishing order, the night went exactly according to Hogan’s plan. He started seventh, bided his time and made his way through the pack late in the event. He had an exciting side-by-side dual with Tim Sauter at the finish and just barely nipped the more experienced driver for second place. That propelled Hogan into second in the standings going into the season finale in two weeks. “I’ll consider it a success as long as we come out of here with second (in series points after the official results are posted),” continued Hogan. “I think we got a top-three points' position locked up. I think that we gained a lot on Fultz and we should be able to stay in front of JR as long as we have a good race in Montgomery. 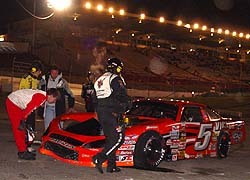 Hogan knew that a jump in the points was possible after seeing the second-place man, Norris, have tire problems which lead to a crash in the first few laps. 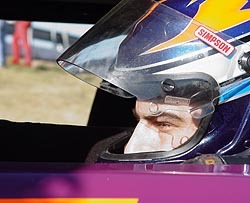 Last time when Casey Smith showed up to the Nashville Fairgrounds racetrack, he completed only a couple of laps after getting involved in a first lap accident that wiped out nearly half of the field. Jason Hogan now sits second in the point standings. This time around, Casey still didn’t complete the whole race, but 140 laps were better than two. “It was nice to actually finish most of the race,” said Smith. “We were fast in practice. We didn’t qualify as good as we should have, but we bottomed out. That is disappointing, but it happens. We are just disappointed in the race because we thought we had a car that would run in the top three for sure. It just didn’t happen tonight. Casey Smith had a better run at Nashville than earlier in the year.